So good with hummus! If they puff for you, you can make a mini sandwich with some roasted turkey or chicken, hummus, lettuce, tomato, purple onion, cucumber. Delicious! This recipe is pretty easy to do. I will say I have tried this with all Sprouted Wheat Flour and they were very heavy, didn’t puff. This recipe was my second go at it, and I like it, so I have not tried any other blends. I think Spelt Flour for P1 will work nicely by itself- it is much lighter than Sprouted Wheat. The oil per serving is pretty minimal- if you want to be strict with your FMD plan, just use these in Phase 3. I used my pizza stone to cook them on but you can use a baking sheet lined with silicone baking mat that has been preheated. You can also add fresh chopped herbs or garlic to the mix to flavor the dough. Mix dry ingredients together in a bowl. Add olive oil, lemon juice and ¼ cup water. Mix with your hand until a dough forms, adding very small amounts of water at a time, until all the flour is incorporated. You do not want a stick wet dough. Knead the dough in the bowl for a minute, then move to oiled counter top. Knead for 5-10 minutes until the dough smooths out. Place in oiled bowl and cover with damp towel in warm place. Let double in size. Preheat the oven to 450 with the pizza stone on middle rack. Turn out dough onto lightly floured counter. Split the dough into 8 equal pieces. Roll each ball into a round, just less than ¼” thick. Place them without touching on the pizza stone or baking sheet and bake about 5-7 minutes. They will not brown a lot but should puff a bit. Keep in airtight container. I have not tried freezing these, however the original recipe I modified from says they can be frozen. 1 pita is a standard grain serving in phase 1. 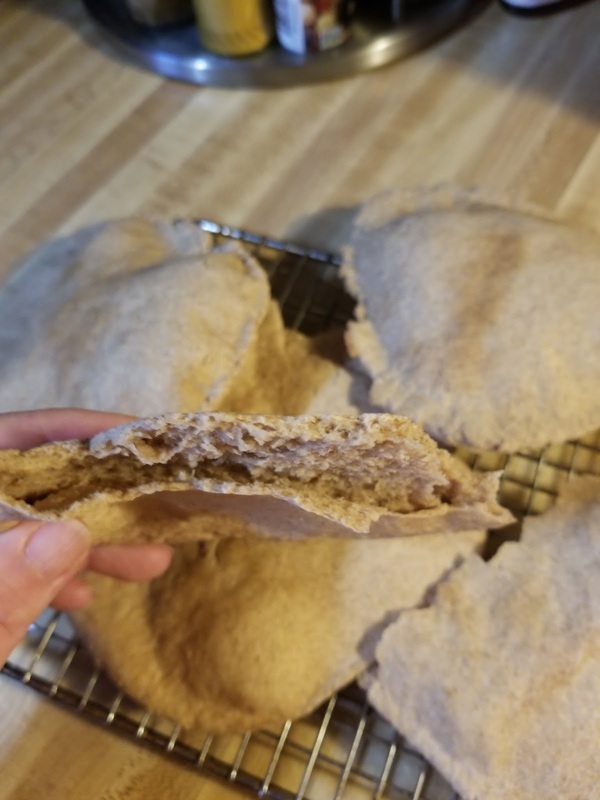 ½ pita for phase 3. You want to put them on the hot pizza stone or hot baking sheet so there is space between each one. You don't want them touching each other. Carolyn, I'm from Brazil and live in Brazil. I'm trying to find sorghum flour and I didn't find yet, is it possible to sub for something else? 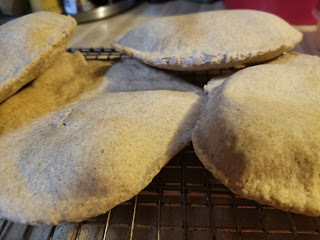 I love pita bread and would love to be able to make it here. I have not tried a by other FMD flours that would replace it. Can you possibly order online?